I don’t know how else to describe last weekend. It was a whirlwind of setbacks and progress and chaos and I’m so glad it’s over. And much like the worst storm in 10 years that just hit our area, I think the darkest days of this journey have passed. At least we can hope. I try to maintain a positive and uplifting narrative but it’s also important for me to be open and honest, which means sharing the not so fun parts of this experience. And what good is a story without both the highs and lows? The struggles make it so much more rewarding in the end. So thank you, stressful weekend, for making this journey that much richer. Let’s start from the top… in no particular order, as there is no structure to the madness right now. It has been an unseasonably rainy/snowy winter, which is great for the drought in California but horrible for productivity. 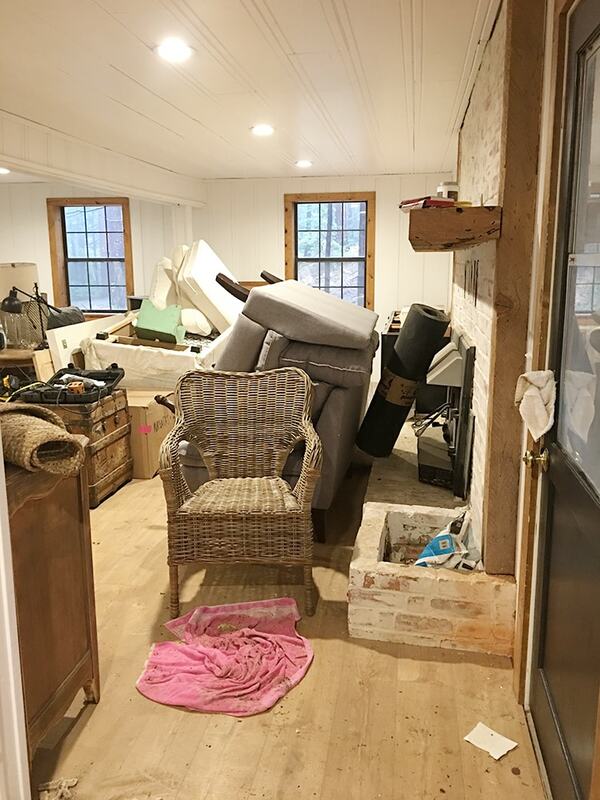 Last Friday the clouds parted for a brief moment, so I had to schedule moving all of the furniture into the flip. 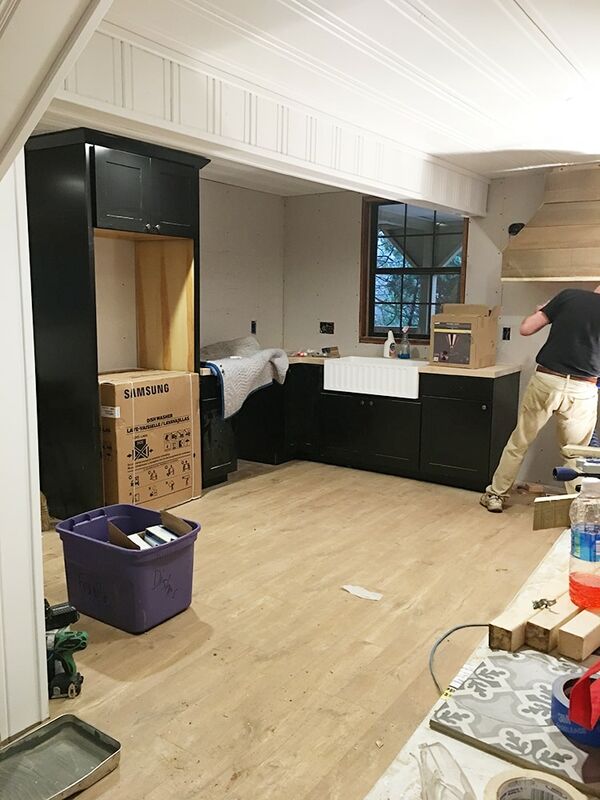 I had been planning this for a while, and it was designed to be perfectly timed as the flooring was supposed to have been done the week before, so all of the bedrooms would be clean and ready to start setting up the furniture. The furniture had to be moved in ASAP so that I could arrange it, figure out what I still need to order, and have it arrive by the photoshoot (scheduled in less than four weeks). Well, we show up and the house is exactly in the same condition as we left it on Christmas. 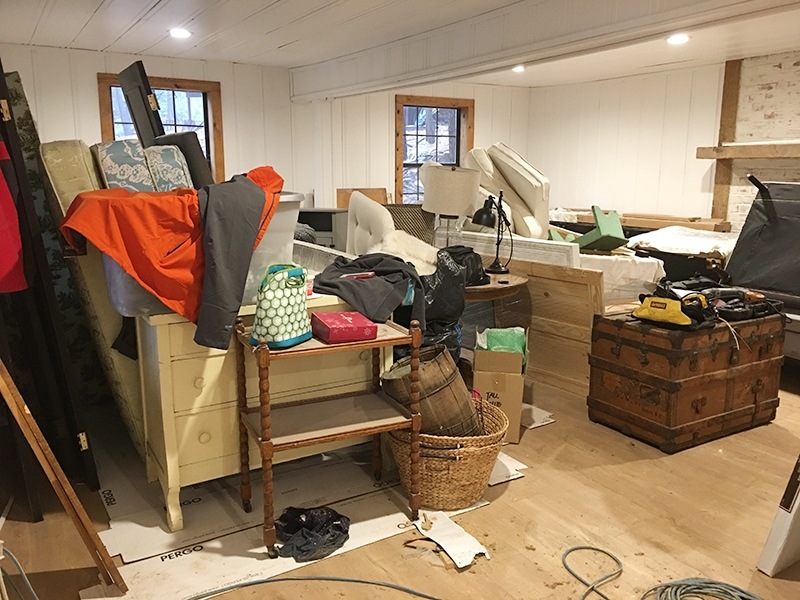 Piles of sawdust and wood and trash everywhere, baseboards not even installed—there wasn’t a single room that was finished or even clean enough to move furniture into. And just like that, the entire schedule went down the drain. It was a sad day. 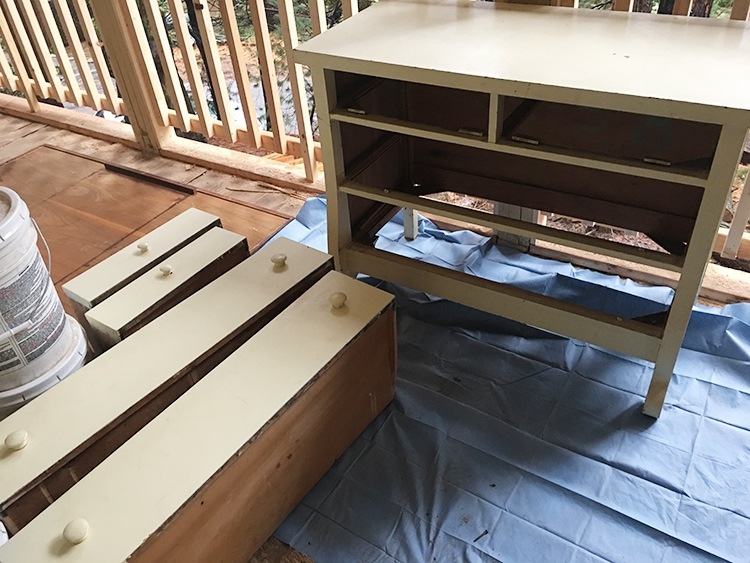 For those who were asking, I also plan to stain the counters in the same shade and use the water based poly to seal them (along with the hood boards). 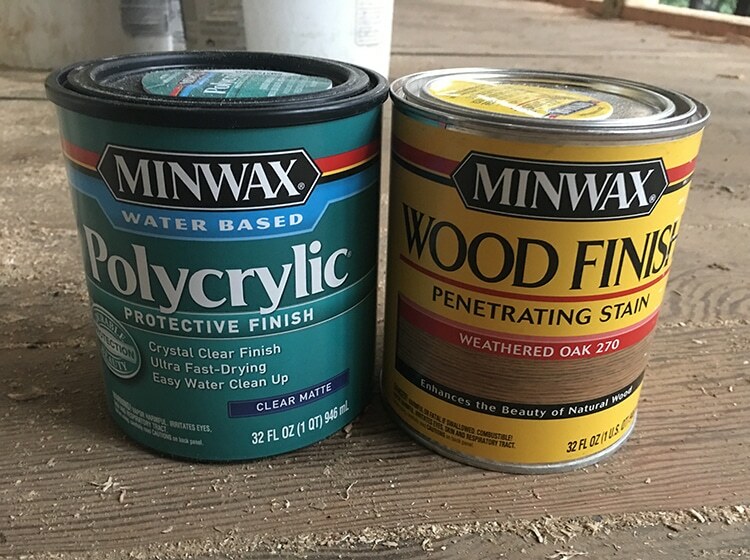 I came to this decision after reading through numerous bloggers posts and experiences, and weighing the pros and cons of poly vs Waterlox vs Mineral Oil. 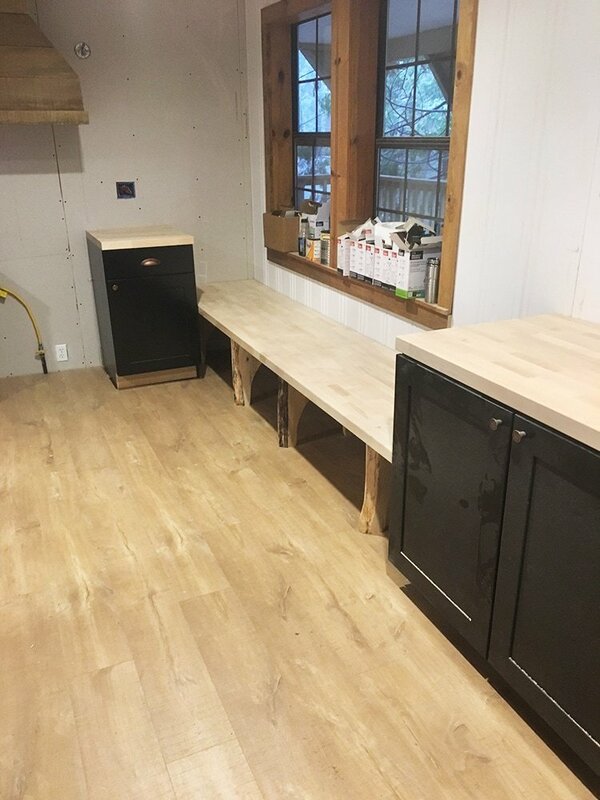 The only downside to the poly is that it isn’t food grade, but not having orange counters was a better trade off in my book 🙂 I’ve stained butcher block with poly in my previous laundry room with amazing results so I feel confident about going that route again. 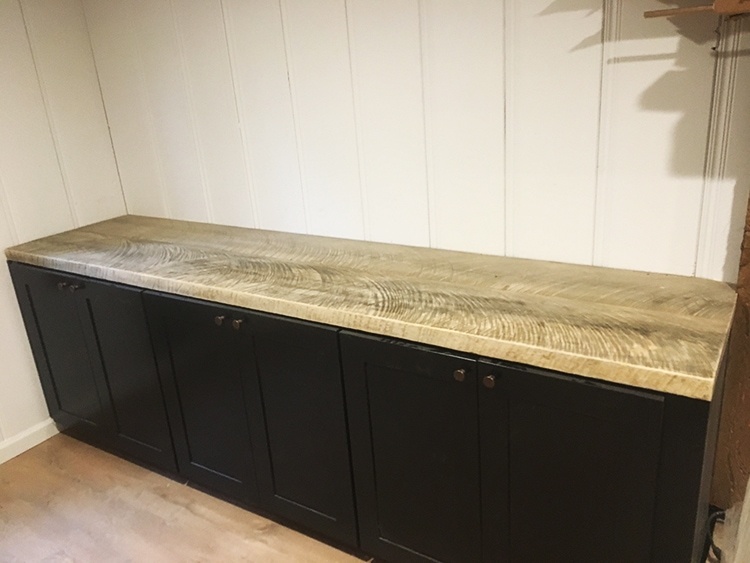 UPDATE: I just spoke directly to the butcher block counter manufacturer about this and he’s looking into options for food safe coatings that can be applied to the stain without changing the color. I’ll let you know what happens! Side note—the appliances were delivered but the delivery guy couldn’t get his lift up the snowy hill and my contractor has to rent a dolly to bring them in, so the fridge and stove are sitting under a tarp up the street. Let’s hope they survive. 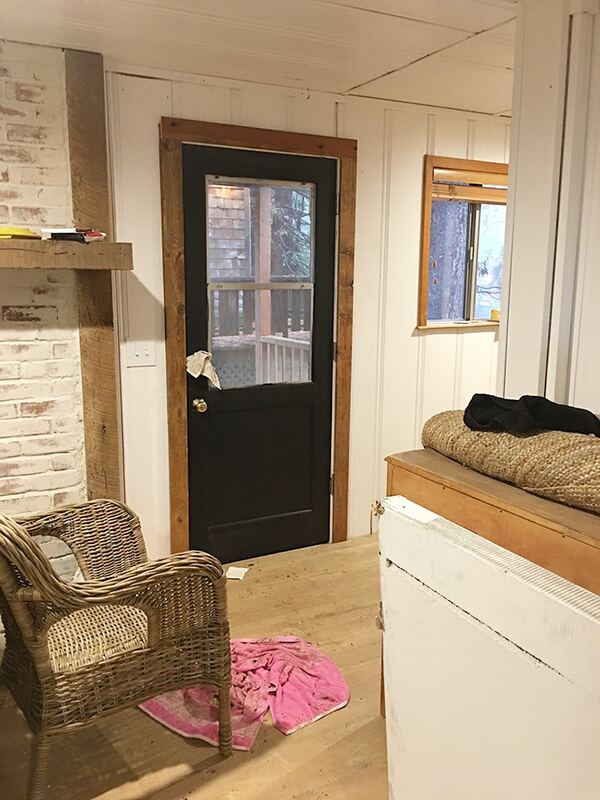 Leaning towards painting that door trim white—thoughts? And a new laundry room chandelier—the lighting in here is SO gorgeous in person. 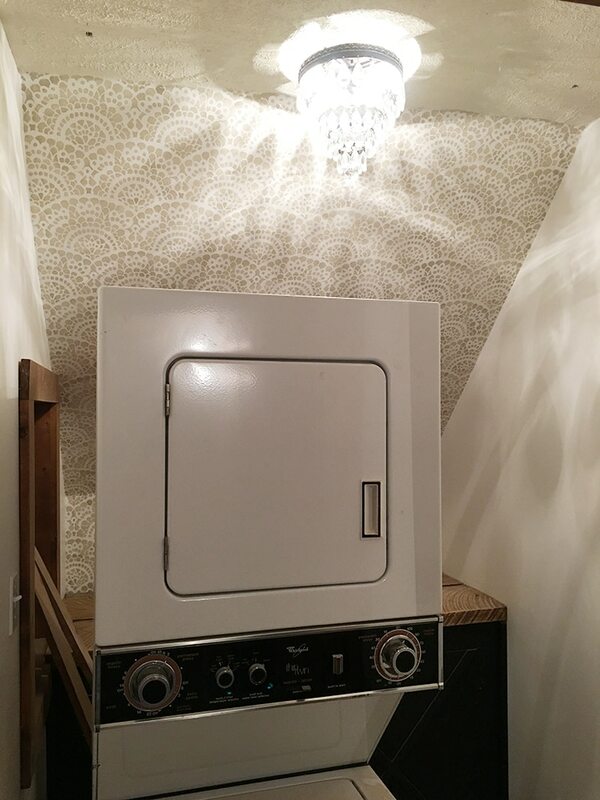 I wish my phone could capture it… ignore the washer/dryer, they’re back in place by now. 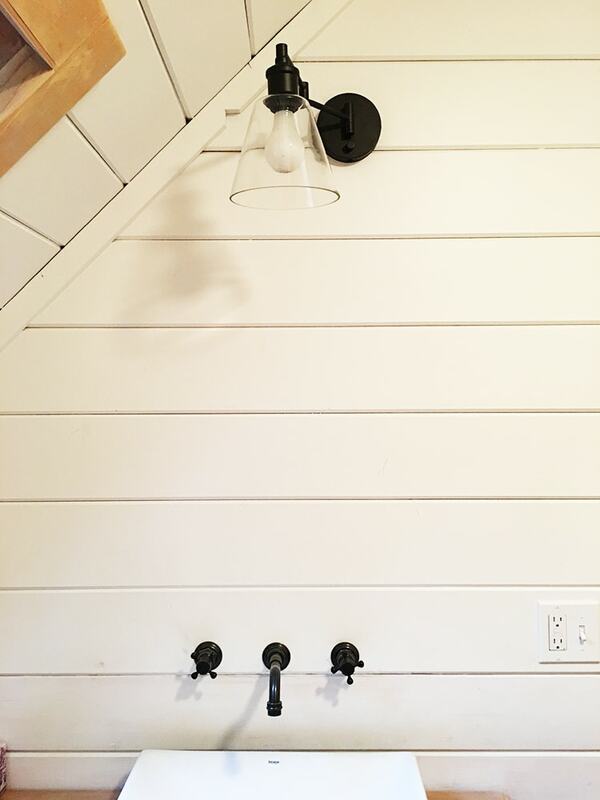 And perhaps my favorite… the upstairs bathroom swing arm wall sconce. Yum. A beautiful round gold mirror will be hung there soon! So pleased with my tile choice. It looks greenish online but it’s really a neutral gray in person, for anyone considering it. It has my seal of approval. 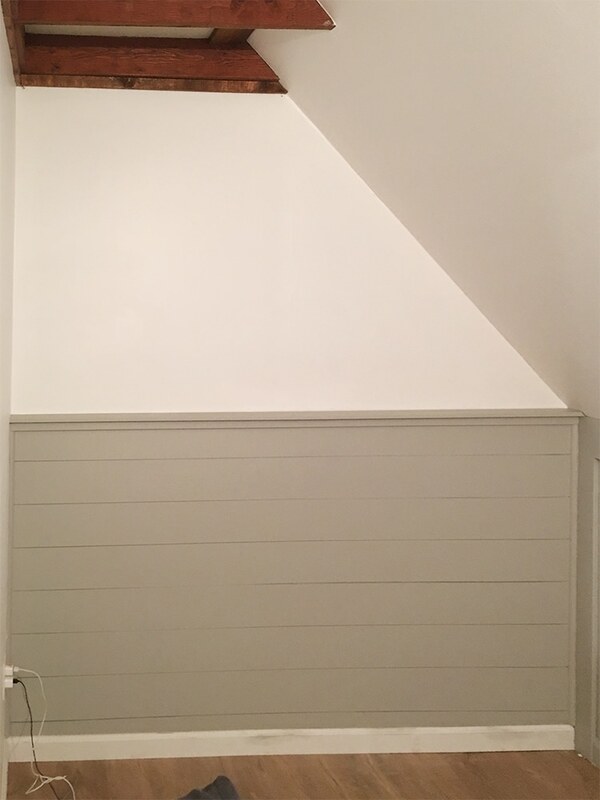 I used my easy DIY shiplap technique, and we finished the top with a 1×2″, a 1×2″ shelf ledge, and quarter round strips vertically in the corners. Every single one of you (except one) said to keep them black. So that’s what I’m leaning towards. For whatever reason, the doors didn’t want to go back on straight so we had to make some modifications. There were also missing screws, and one missing hinge which I can’t find a replacement for so that’s one more tiny but crucial detail to go on my ever growing to-do list. And that sums up Friday afternoon & Saturday. On a stormy Sunday morning, my mom and I trekked up to the cabin ready for a full day of painting the bedrooms. I walked inside, flipped on the light switch, and nothing. Pitch black. 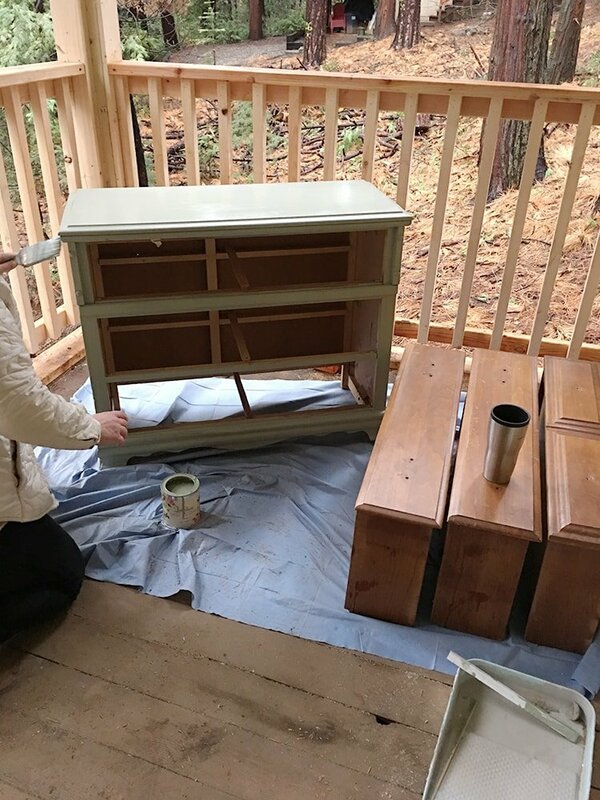 The storm had left us without power but the clock was still ticking, so my Plan B was to drag a couple dressers out onto the porch where there was just enough light to see, and attempt to get some furniture painted. 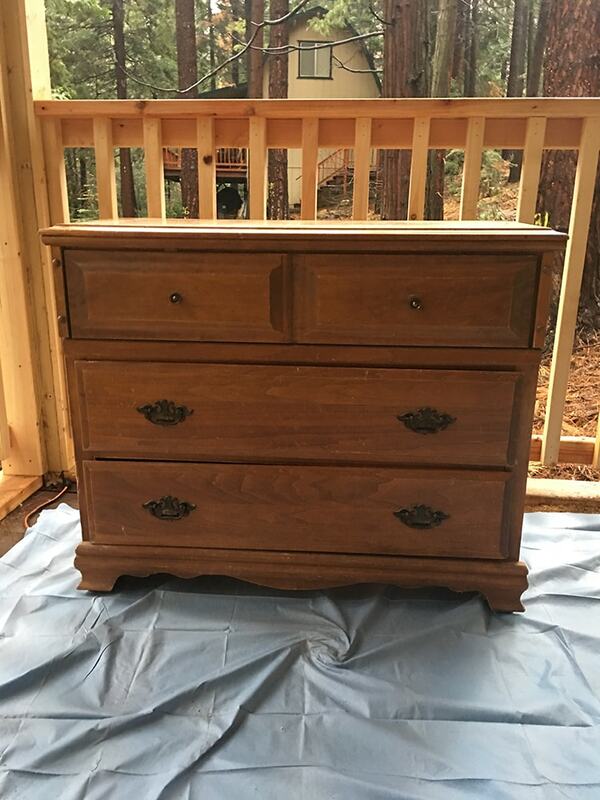 The trim work behind it will be painted a light gray, and I was wanting a dark gray for the dresser but didn’t have anything close, so I improvised. Maison Blanche’s Wrought Iron mixed with a bit of Coquille. And for this one, I chose Maison Blanche’s Printemps. The most beautiful shade of pastel green you ever did see. But after the first coat went on, it started pouring. Then the wind came. Then the dressers were soaking wet and we tried to bring them inside but dropped one in the dirt and the paint came off and we gave up. Now they’re sitting outside up against the house because there’s not enough room inside and we’ll have to try again another day. The bedrooms really needed to be painted, but the light from my phone wasn’t cutting it. Then I found a flashlight and we rejoiced like it was Christmas morning. 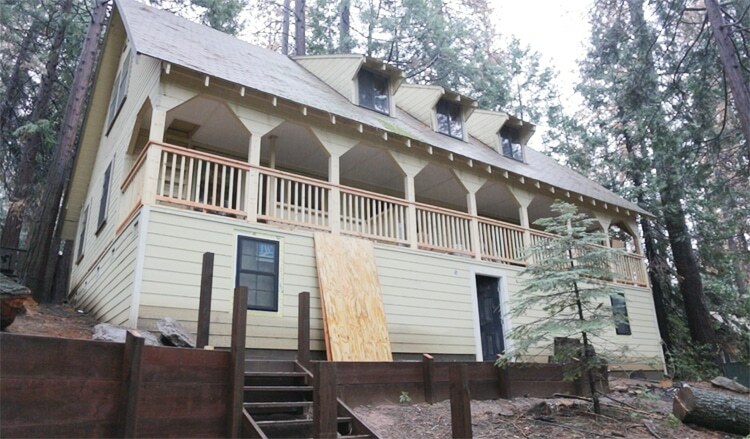 We carefully taped and caulked and coated the trim, painting in the dark for hours while branches fell on the roof and loud noises that at one point we swore was someone banging on the window made us consider grabbing our bags and fleeing to the safety of home. But these rooms aren’t going to paint themselves, especially now that we’re a week behind schedule thanks to the unfinished floors. 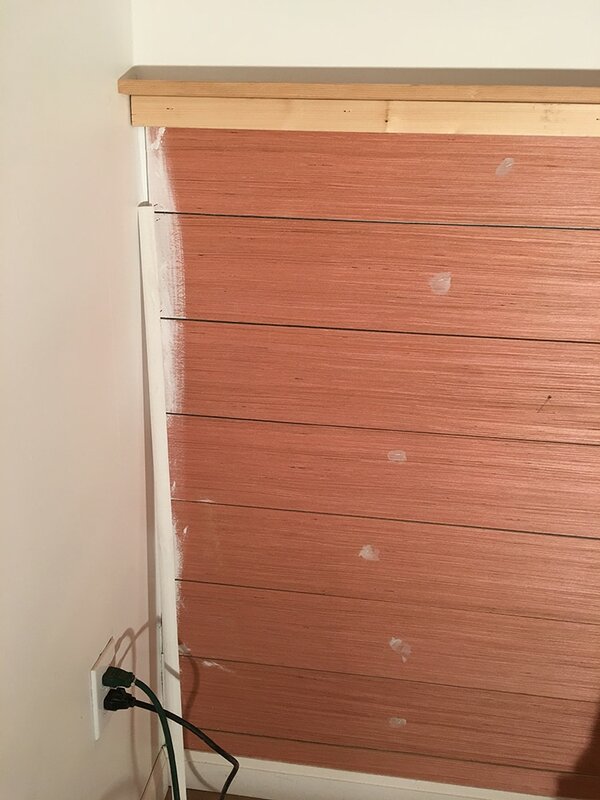 I left the middle section wood in case I thought I’d like it better that way, but nope. It got painted. After a day of defeat, it was a solemn car ride back to my parents house as I came to terms with having to do this all over again the next day rather than return home to the city as I normally do on Mondays. My sweet parents felt so bad for me that they both agreed to take the day off work to come help me. I don’t know what I’d do without them. We showed up bright and early Monday morning to the welcoming sight of the flooring installers, who weren’t even expected to show up. They assured me the floors would be done in a couple days or so which was the best news I’d heard all week. 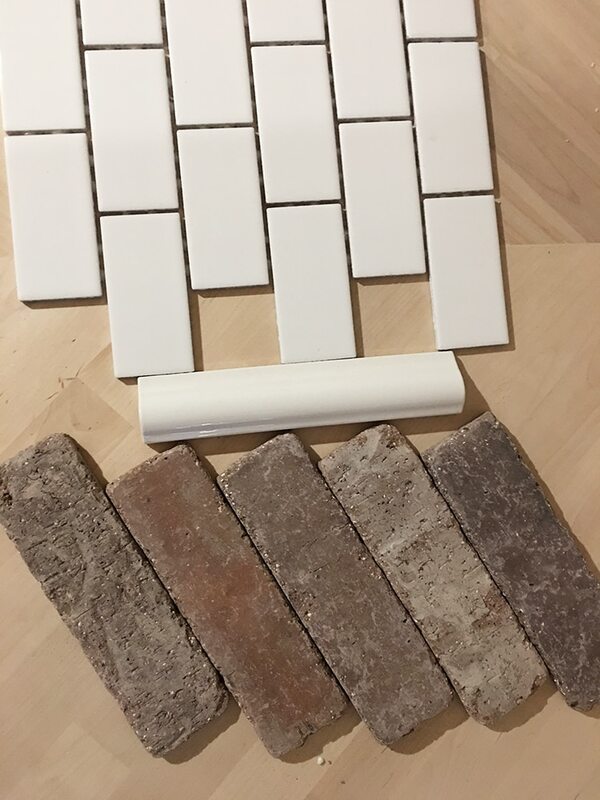 While they were scurrying around the house installing baseboards, my general contractor was there with his crew installing countertops and shelves, digging trenches and building benches while my tile guys were wasting no time in the downstairs bathroom and going over kitchen plans. I was running around trying to film & instagram & snapchat it all while answering contractor questions and helping my parents paint upstairs. It just opens up these rooms and looks so heavenly with the new floors. 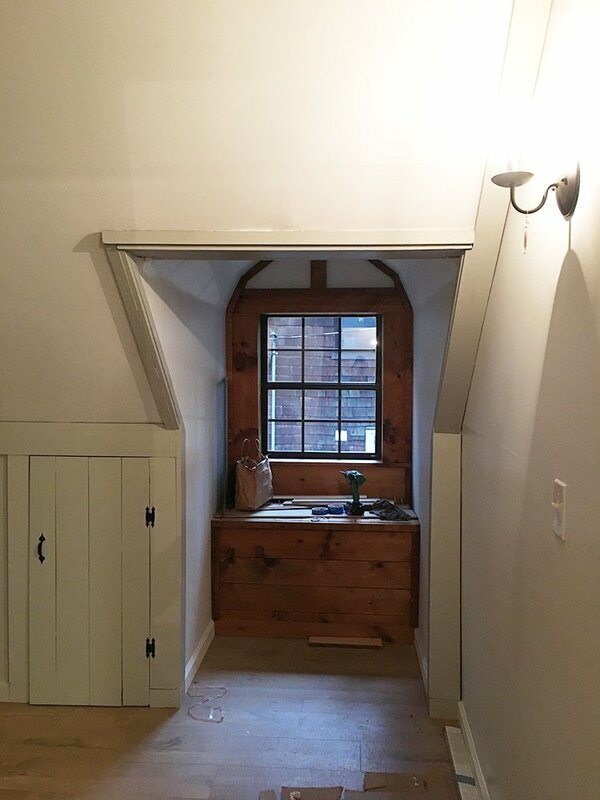 I wanted to keep some of the original wood so I left this nook unpainted. Still undecided. 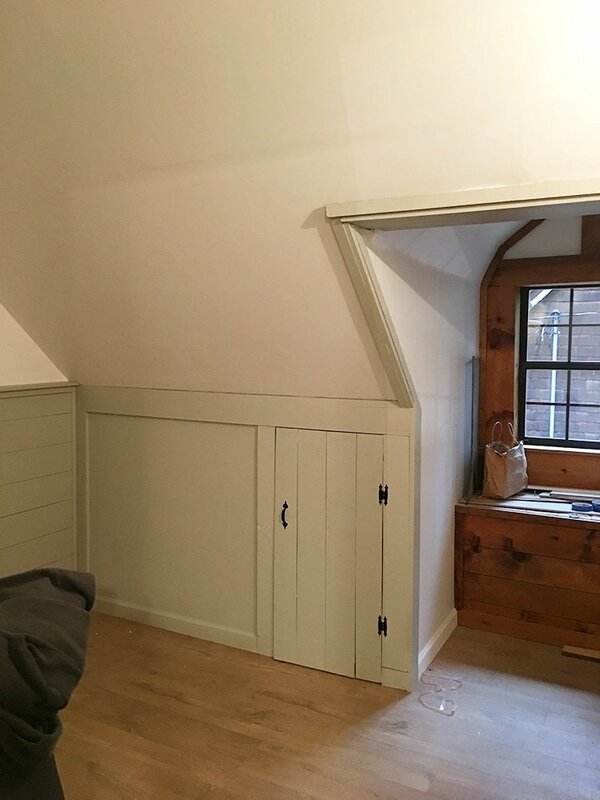 But seeing those rooms transformed by paint really turned things around for me and brought my spirits back up. Next Friday I’ll be back to finish it off before finally moving the furniture in. 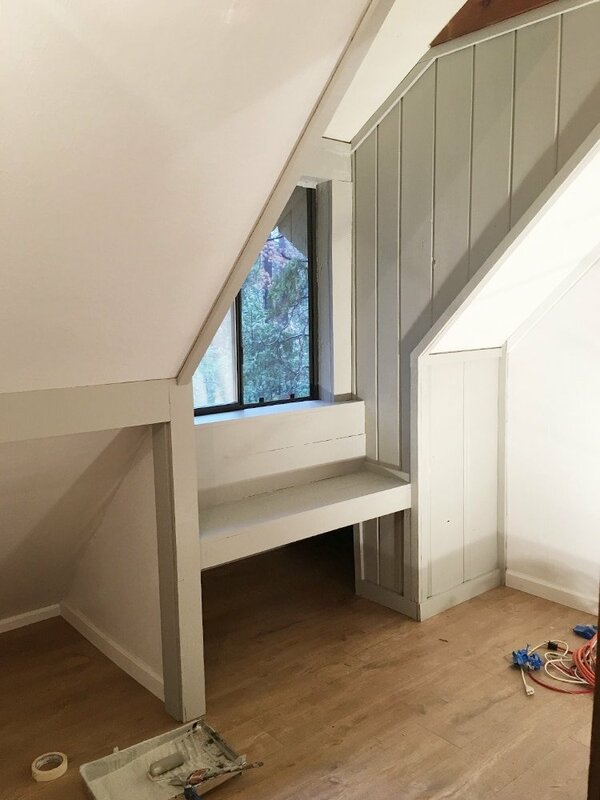 Second, we have our window seat bench! 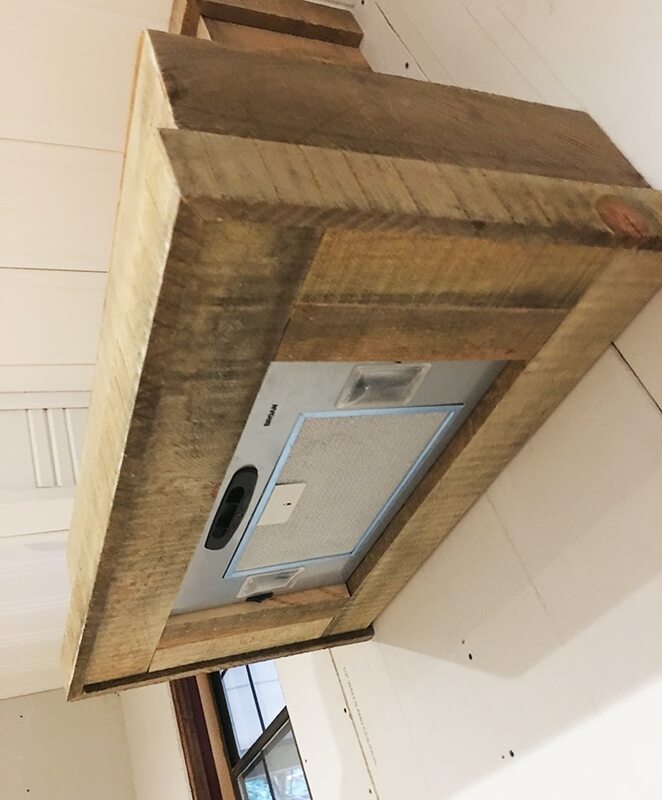 The top was made using the same butcher block from Lowe’s. 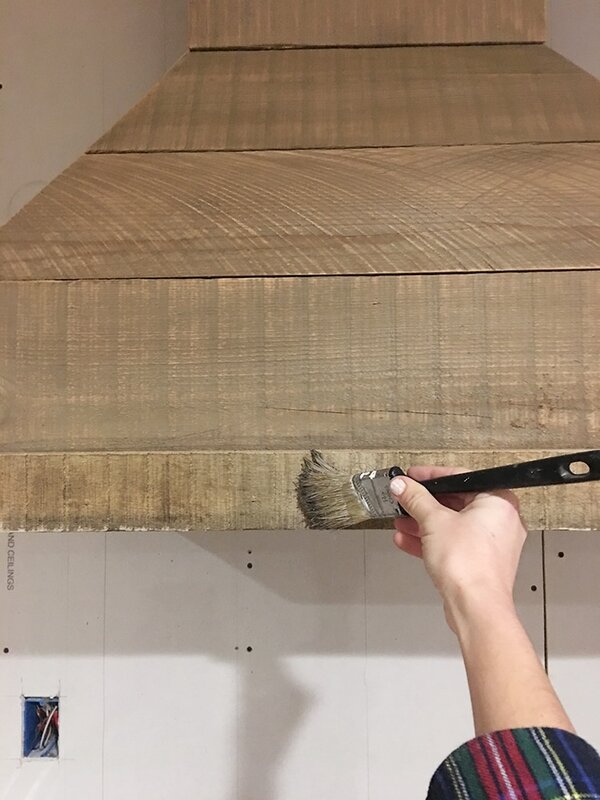 It’ll all be stained & sealed with Minwax Weathered Oak and polycrylic. And there’s a 50/50 chance I’ll end up painting the window trim light gray to break up all the wood. Can’t wait to decorate those babies. In other news, two major ongoing issues that have been adding stress to this project are the exterior paint and new roof. Because of the nonstop rain/snow/freezing temperatures, there hasn’t been a window of opportunity in months to paint or replace the roof. After talking to several roofers, at this point and with the projected forecast, it’s just not going to happen. The roof is structurally fine, it’s just nearing it’s lifespan and has fallen behind on maintenance, so all we can do is clean it up and hope for the best. 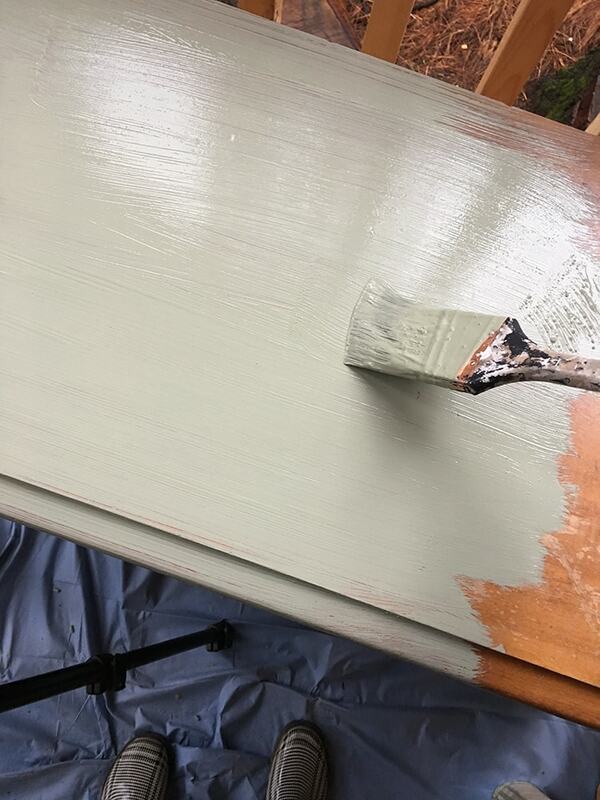 In order to paint the exterior, the weather must be both dry and above 32* for several days for the paint to properly cure. That is not a possible scenario here in winter, so they’ve been looking into renting fumigation tents to cover the entire house and industrial heaters to keep it from freezing. We’re talking every possible creative solution here. 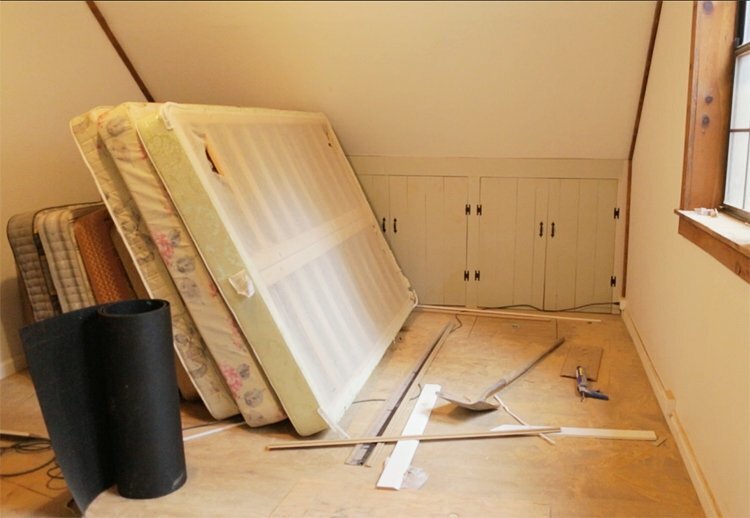 They searched the entire state and were unable to gain access to one, so Plan B is to attach plastic tarps from the roof to the ground as a protective barrier. Not exactly a simple mission for this house. We’ve been constantly checking the weather to watch for any possible openings, and it looks like there may actually be one this weekend—it will be freezing but at least no rain. Send all your positive vibes my way that the forecast doesn’t change—we really need a break here! Whew…. that was a long winded post. Who wants to get into house flipping? Don’t all raise your hand at once now. Enough blogging, I’ve got another weekend at the flip to prepare for. If you still want more after this novel of a post, you can catch the daily updates on instagram, snapchat and facebook and watch the madness unfold in real time. Your comments & feedback are appreciated more than you know! Disclosure: Some of the products listed were provided via sponsorship—all of which I selected and fully approve of. I have been a fan for quite a while. I hate to be critical, however, I feel very strongly about your finishes in your kitchen. To put something that is not food grade on the counters is highly disrespectful to your future buyer. Do you plan to disclose this to them prior to them? Secondly, all I can envision on the range hood is a pile of dust and grease on top of it. It’s tough enough to keep a smooth surface grease/dust free around a stove, but with a rough wood surface, I imagine that would be impossible. I’ll admit, it looks great, but these decor decisions would make this kitchen a no-sale to me as someone who uses their kitchen a lot. I honestly can’t think of any food I put directly on my countertops. It’s either on a plate or a cutting board or a trivet. What food do you prepare directly on yours? Hi Shelley, I appreciate your feedback. 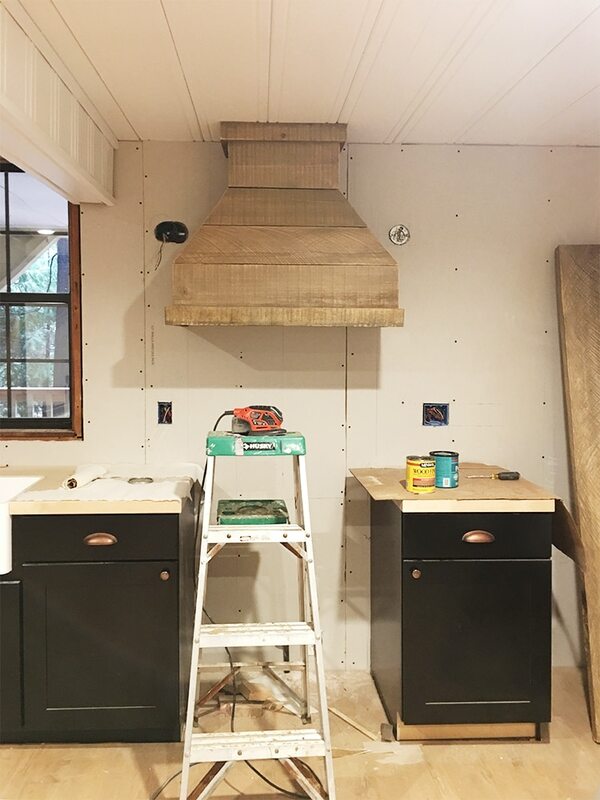 The range hood will be sealed with matte sealer to avoid those problems. I also sanded the boards so they aren’t as rough as they may appear. As for the counters, it’s no different than eating at a table surface or bar top. 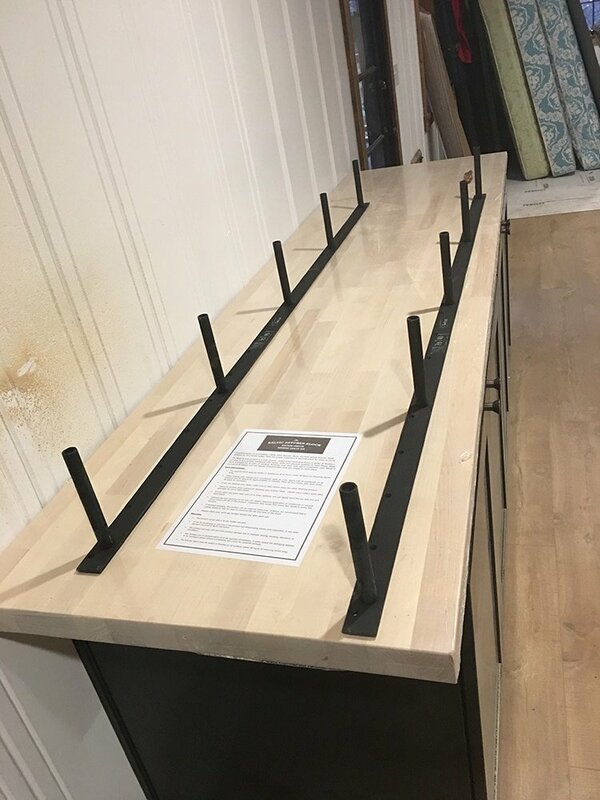 Many kitchen islands use wood without Waterlox or mineral oil. 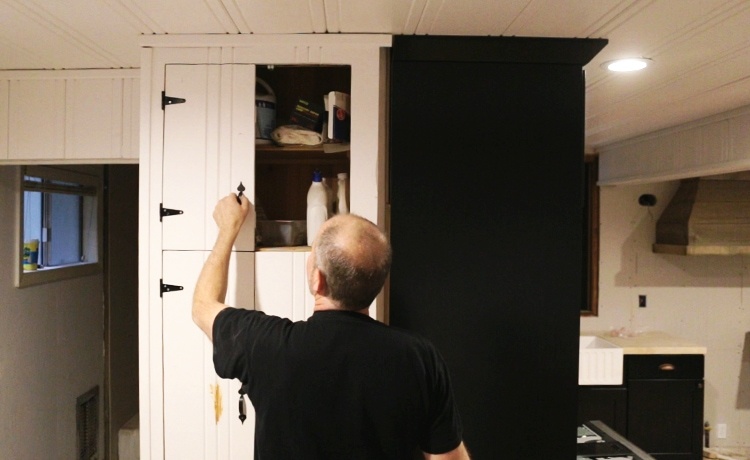 It’s not a perfect solution, but it’s also used quite frequently and I know it’s not everyone’s preference, but nothing will please everyone 🙂 I had to weigh the options and make what I thought was the best decision for this kitchen, and it’s what I would do if it were my own. Have to agree with Shelley. 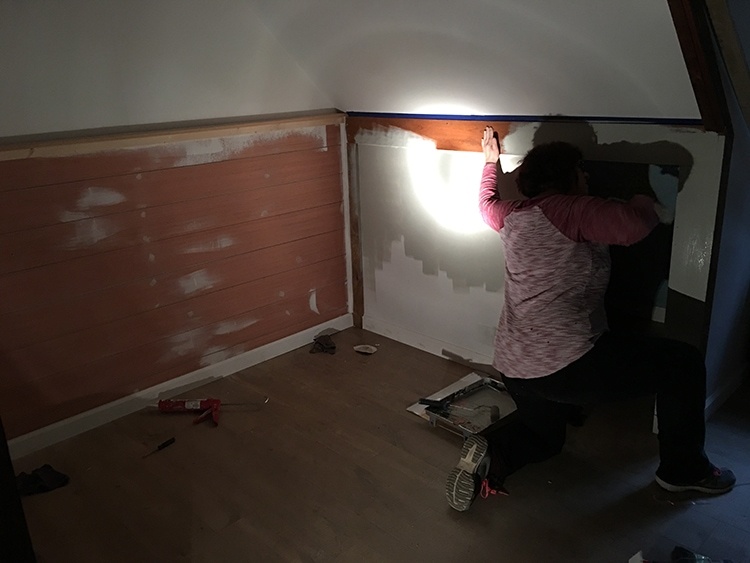 There’s no way to please everyone design-wise, but I wouldn’t compromise health (or functionality) for esthetics, especially when someone else will be using this prep space. I don’t cut on my wood counters, but some do, and food does sit on counters, even if just briefly during prep. Wont cutting on water-based poly, or even just wear and tear from pots and pans and plates sliding around, eventually chip it? Just added an update to the post — I’m in contact with the counter manufacturer and we’re working on possible solutions. He said the sealed surface itself isn’t toxic once it dries, so you can eat something that sat on the counter (not washing it first would be a much bigger issue). Really no different than eating something off of the dinner table. It only comes into question if you are cutting into the surface and end up ingesting the actual sealer. Plastic water bottles might be more of a health hazard and we all use those 😉 Still looking for the best option though! I have to say that I 100% agree with you about the non food safe countertops and the range hood. 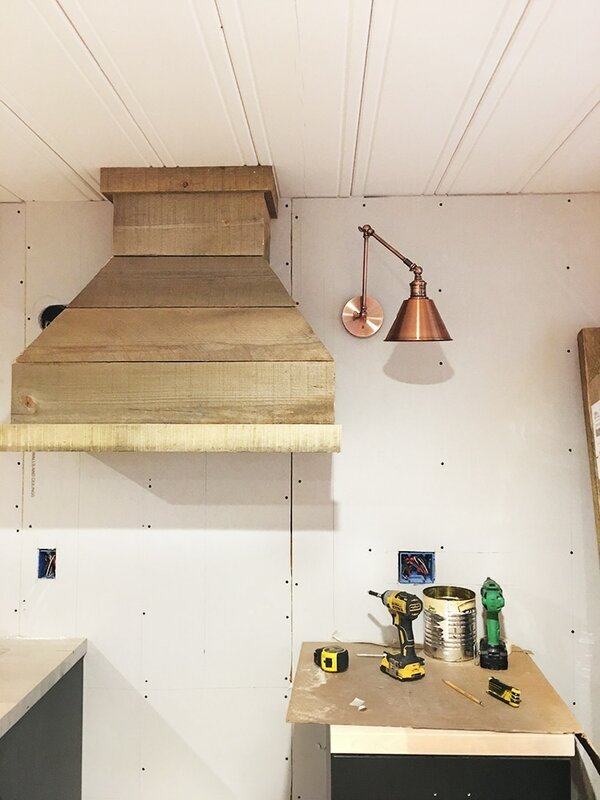 It may look great but the range hood is going to be a royal pain and impossible to clean. It will be a greasy, dull mess eventually unless there’s some kind of epoxy finish to protect it. 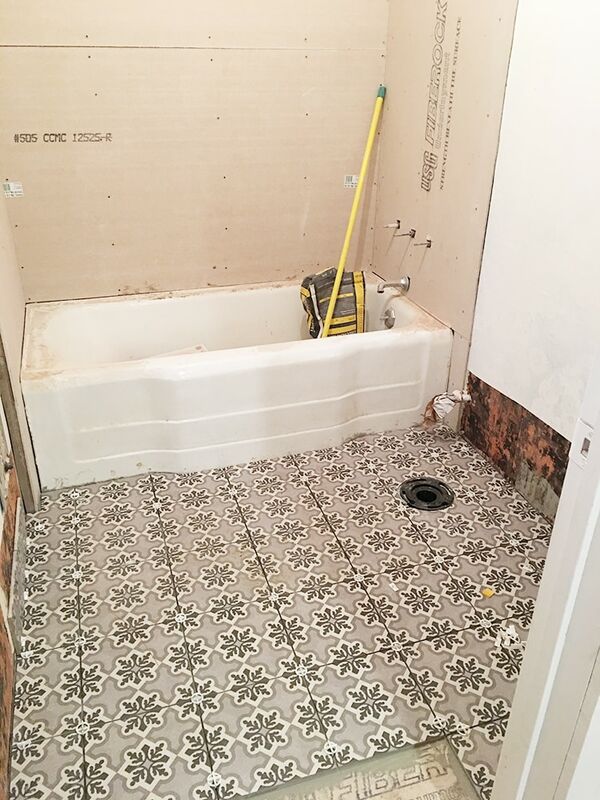 Also, the tile floor is fantastic and all the wood in the bedrooms should be painted. Around the windows and doors should be painted too. Its cleaner and fresher painted and not so dark. I love these updates! Keep them coming. One question though, I know you have a tight deadline and a lot of work to do so what’s the reasoning for not just setting up a bed at the cabin and sleeping there so you can work on it full time and not just the weekends? Hi Jenna, I have to be in the city to work during the week but I definitely plan on staying up there during the weekends when I can! It hasn’t had a functional sink until now, and hopefully this weekend we can get the beds/bedding set up and start staying the night. Wow! The transformation is amazing! 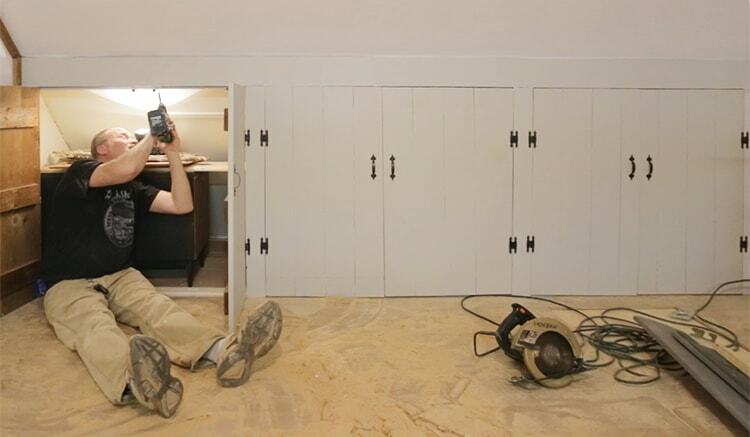 You are doing such a great job, and yes, this kind of does make me want to get into house flipping. I can’t wait to see the finished product! Hi Jenna! It’s an exciting day when I sit down to drink my coffee and I see a new update from you! 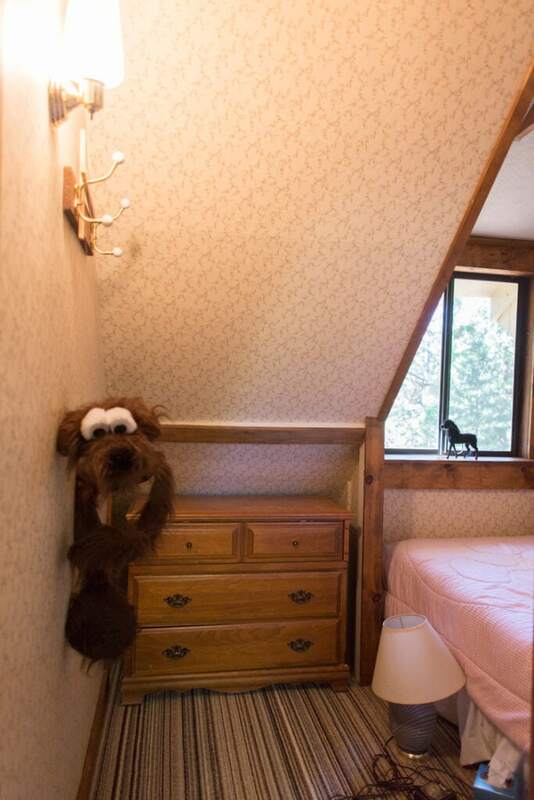 You mentioned being undecided about painting the wood around the window nook in one of the bedrooms. I think you should leave it wood! It add a little statement in that room, and the arch above the window adds more character to the wood…I love it! 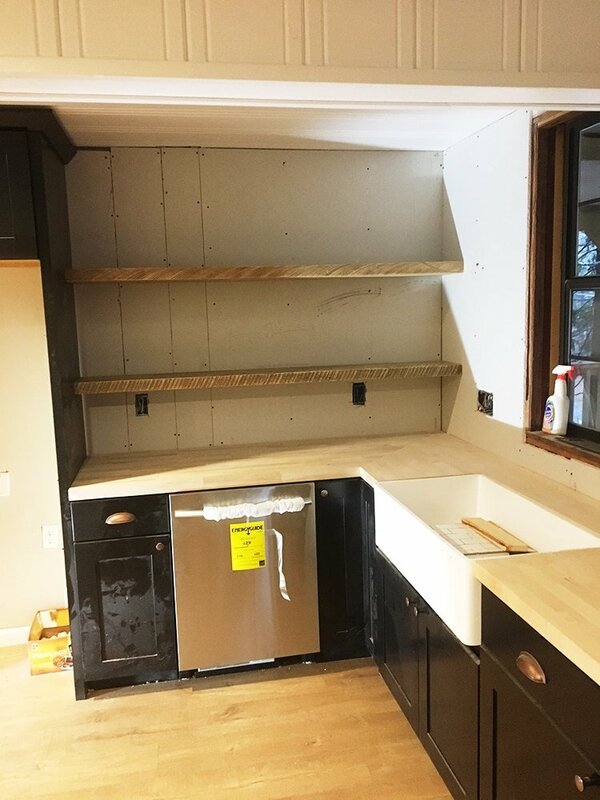 I look forward to seeing the backsplash! Thanks Lauren, I am leaning towards leaving it wood too! Love all your choices! You have had such a vision with this home, and I could catch glimpses along the way, but now I REALLY see it. It’s going to be stunning. haha, aaaaaand i think you should paint it!!! lol. the cottage is looking beautiful. hang in there! i get excited for your updates, too. you are doing what i dream of doing and i love living vicariously through you!! in the “pile of rubble” in the living room, i spied a beautiful antique steamer trunk. where did you find it? what places do you recommend looking for pieces like that? thanks! You are doing such an amazing job! Thank you for all your step by steps and all your photos. It is so fun to watch! Can not wait to see your finish!! You just hang in there, gal. I’m so glad your parents have been willing to help out. I’ll be sending positive thoughts your way so that you have the right weather for your exterior work. That little house is going to be beautiful. The problems you’ve faced in flipping it are the very reasons someone is going to love it–remoteness, wildness, character. I’m loving the updates. I can’t tell you how impressed I am with your tenacity! Even though you have been faced with a lot of crappy issues you just keep plugging away. (I’d of probably sat in the corner and cried!!) It’s paying off…and starting to look wonderful. As someone else said in a comment.. “I can see it now.” And it looks good! Excited to see what comes next!! Hugs to you girl!! I’m a long time follower and love your style and tips! Truly inspirational and I look forward to every Wednesday now! 🙂 How I wish I could hire you for help and inspiration as we are about to move in to our first home here in SoCal. I’m thinking the timing would work for you, and it has a guest house in the backyard… 🙂 🙂 Well, I can wish…but seriously, I’m hitting up your old posts for help and your tutorials are highly appreciated! Good luck with that deadline! And I vote leave the wood in the bedroom, too! You’re doing great! 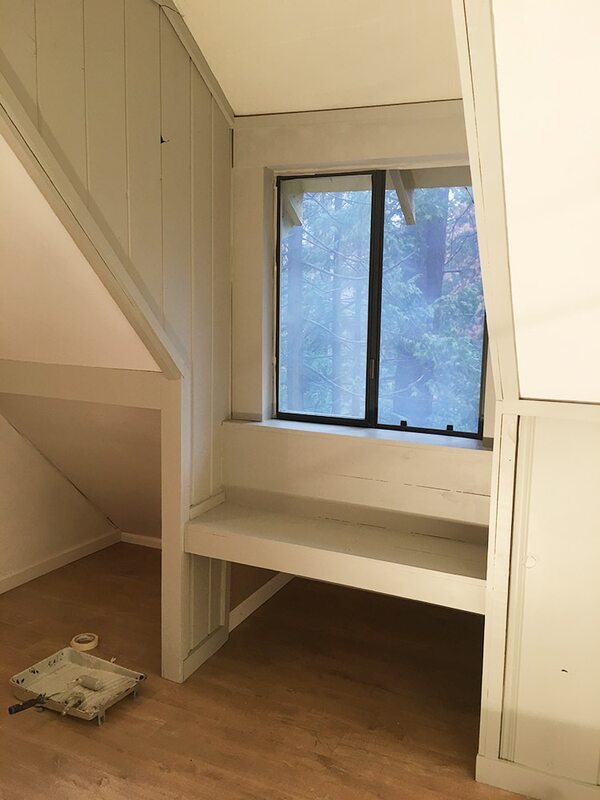 That nook you are undecided on painting – I really like it unpainted. 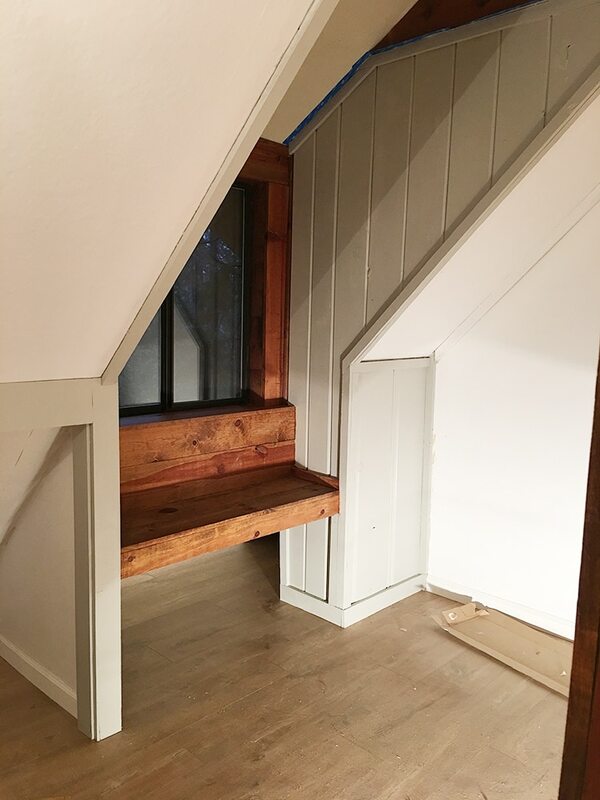 It’s just such a unique and pretty nook and with all the gray it seems right to leave it natural wood. 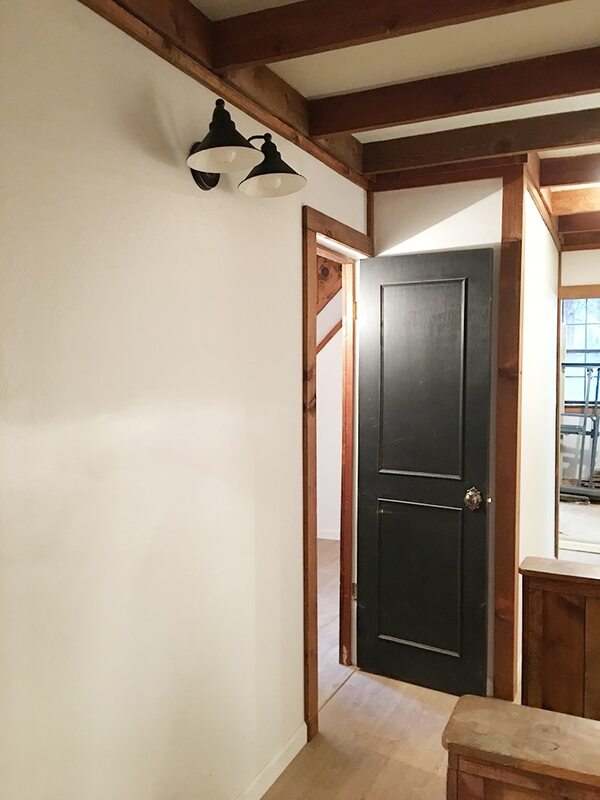 As for the trim around the kitchen door, I think that would look better white. I saw the discussion about the countertops, and while a lot of people don’t eat off their counters, I definitely work directly on my counters to roll out dough, make bread, etc. 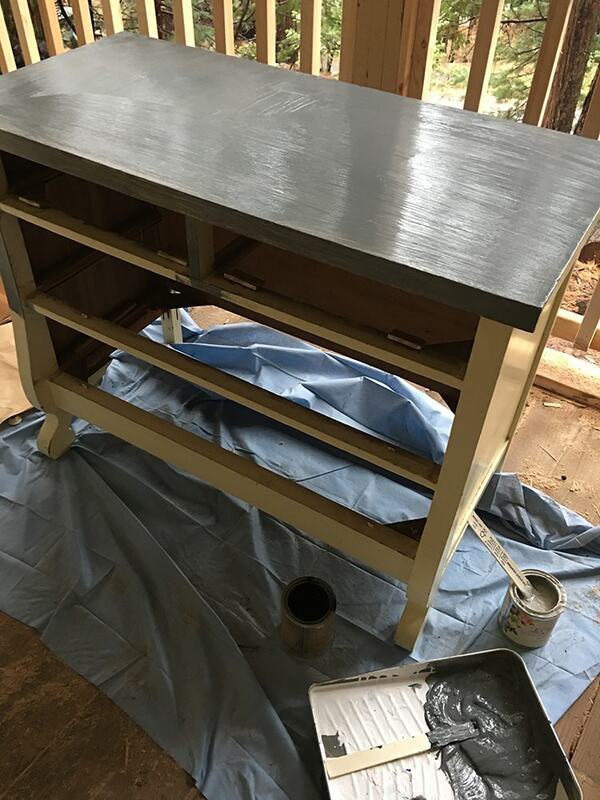 If you decide to use a non food-safe finish, I think it would be good to notify the potential buyers of that because they may use the counters differently than you do. I don’t think it would dissuade me from buying, I would just put a food-safe pastry board underneath to do dough work. I think you have done an amazing job on the house. I do have to say that I am not a fan of the copper with the black and the stainless steel. It just doesn’t seem to go together. Everything looks so beautiful. I love your posts so much. The color palette is serene. Love everything you accomplished this week! Keep your spirits up and it will all come together. Hope you get a break in the weather! Wish I could send you some of our 70 degree weather from Arizona!! 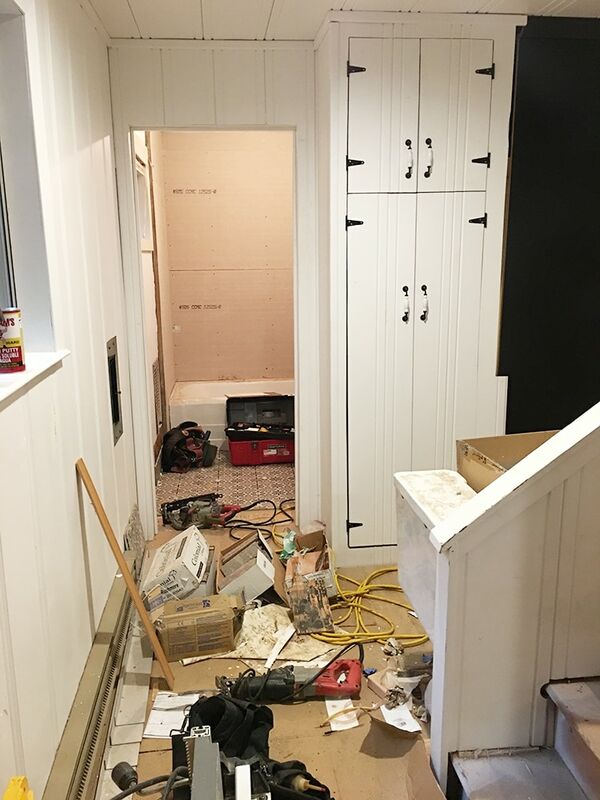 Everything is looking gorgeous and your design style is going to make this a showplace! Good luck next weekend – hope you accomplish all you need to! Bless your heart! 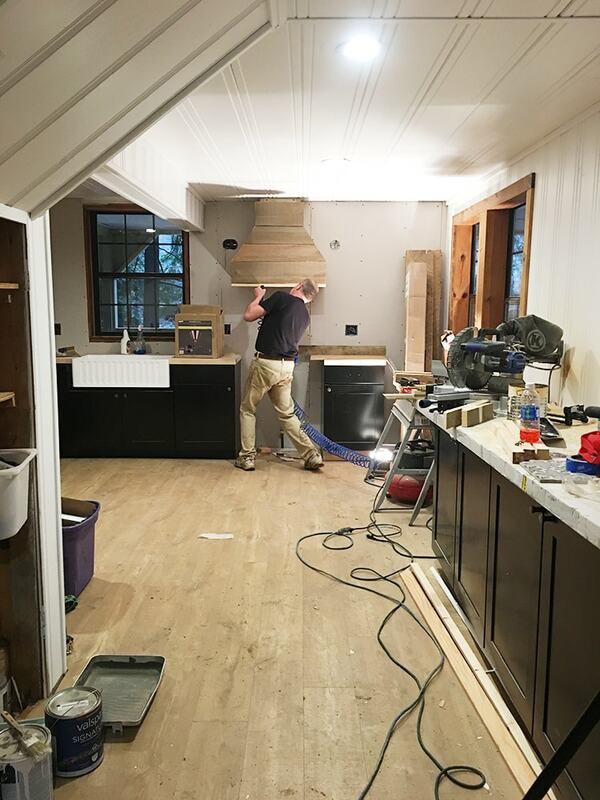 Hang in there; the house is looking great; I know the end result will be nothing short of amazing. Jenna – keep going with your gut on the design – it’s absolutely gorgeous! 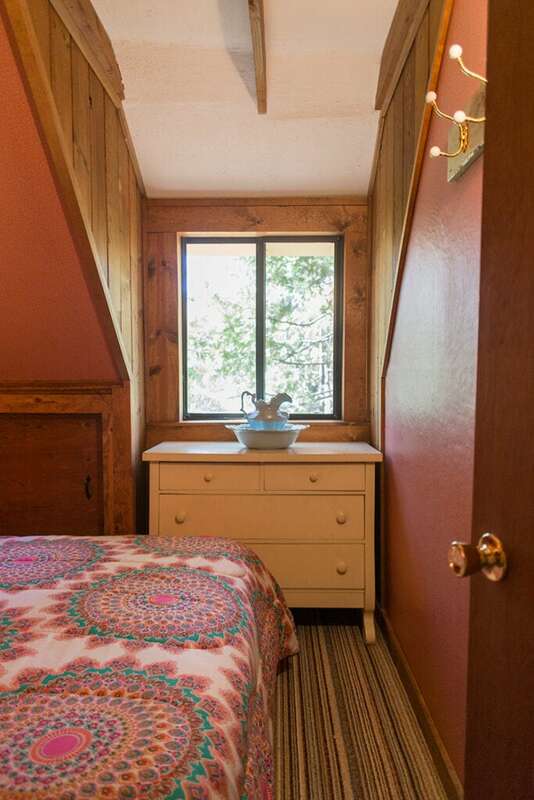 I love how much the place has lightened up while you still retain the original charm with details like the natural wood around the window trim, hardware, etc. I’ve been following your blog for a couple of years now and have never commented but I just happened to read some other people’s comments and felt like they were so judgmental! Your counters and hood look perfect…. 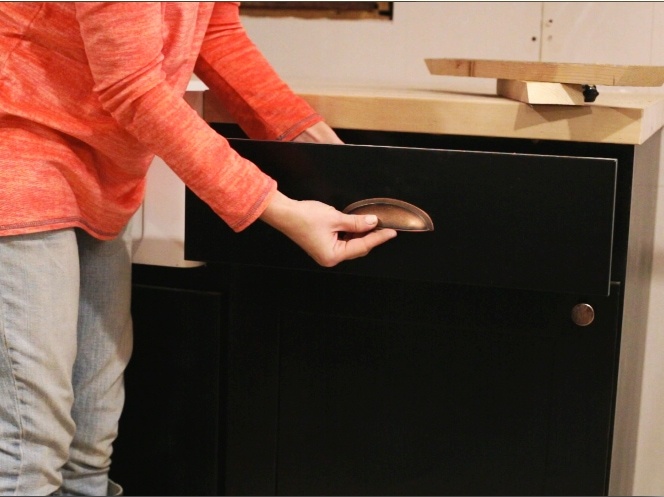 if your future buyers want to cut directly on the countertop (who does that?! Use a cuttingboard, people!) they can always resand and seal it with orangey food-grade sealer! But I wouldn’t want to ruin those beautiful countertops in the first place. For the window bench (with the raw wood) I think it looks a little too orange tone for the rest of the colors, so maybe try one of these two ideas? 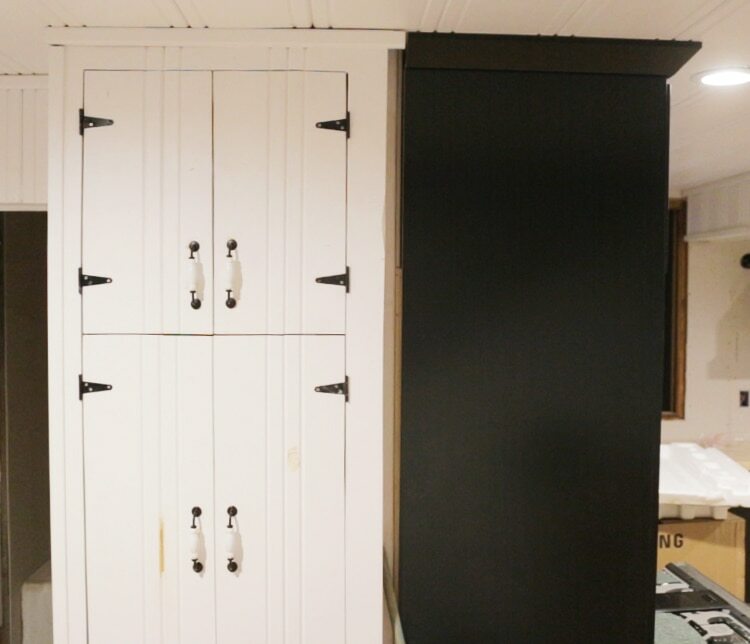 2) you could keep the would, just white-wash it like you did with the top of the vanity. I absolutely love all of your projects and i can’t wait to see how this one will turn out! I can not wait for updates!! I am so excited for you and to see the updates on this project. I live in NorCal and know we’ve had some rotten weather (for us) the past few weekends. I hope you get the break in weather you need this coming weekend! Your style is so spot on…not too farmhouse, not too vintage but just the perfect blend of all the elements that I ADORE! 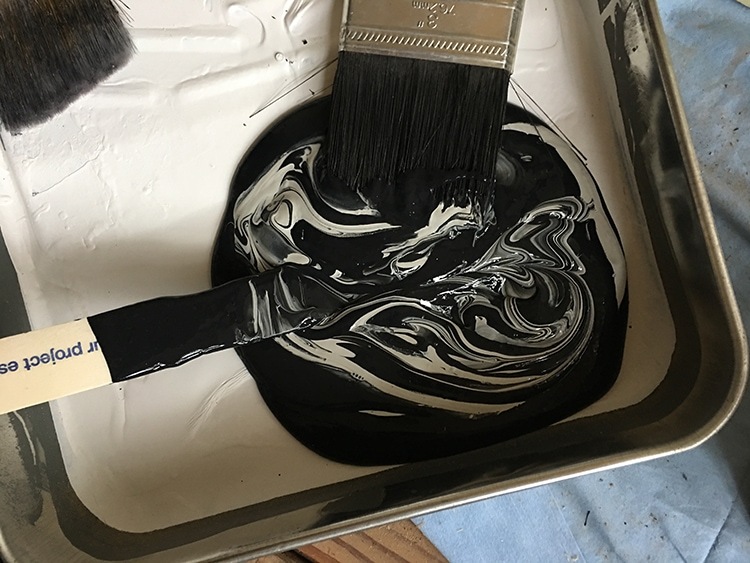 I am SO glad you are back to blogging about design…you are meant to do this! I’m also very happy to see that you have a new love in your life. I imagine that the past few years haven’t been the easiest and am so glad you have found happiness and are following your passions. 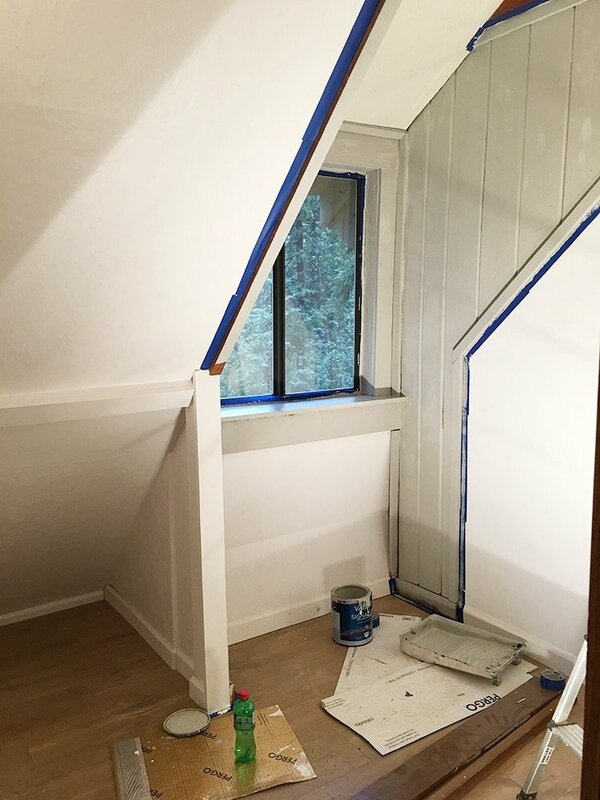 I will gladly help you paint in your next flip if it’s near the Livermore area! :). Or partner with you on a flip…seriously! You haven’t scared off this reader…just wanted you to know that. Take care! That means so much Leslie… so glad you are enjoying the journey and I’m looking forward to sharing more! Jenna you are an INSPIRATION! Regardless of whether anyone likes or dislikes what choices you have made design wise no one can doubt your tenacity and drive to complete this project – and to take the time to share your journey so openly and honestly with the world is just brave. I eagerly look forward to your posts, I love your style and I most importantly I enjoy following your journey, I’m sure there are only bigger and better things ahead for you – THANK YOU! You are doing a wonderful job with this old house. I really like all of your design decisions so far. Painting all of that wood has really brightened up the place. You’re almost done!! Great great job Jenna!!!!! I love watching all the updates on your flip. 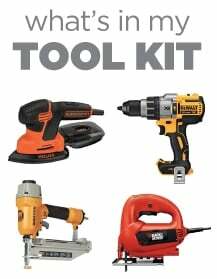 My husband and I have done a couple that we use for rentals now. 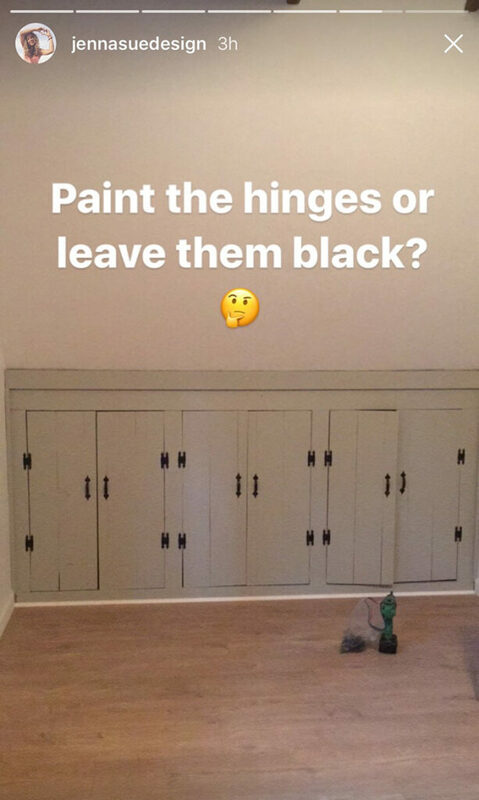 I’m curious when I watched the painting it didn’t look like you used any primer prior. 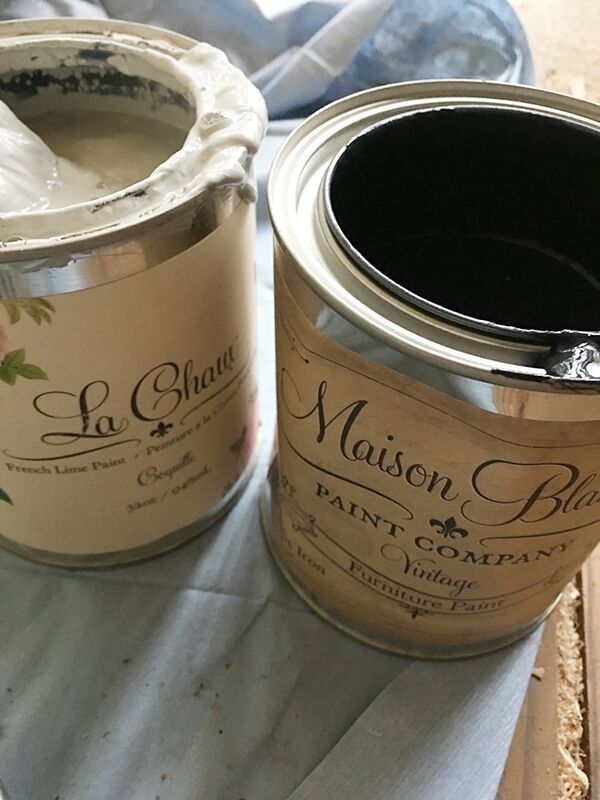 Is this a paint/primer combo? 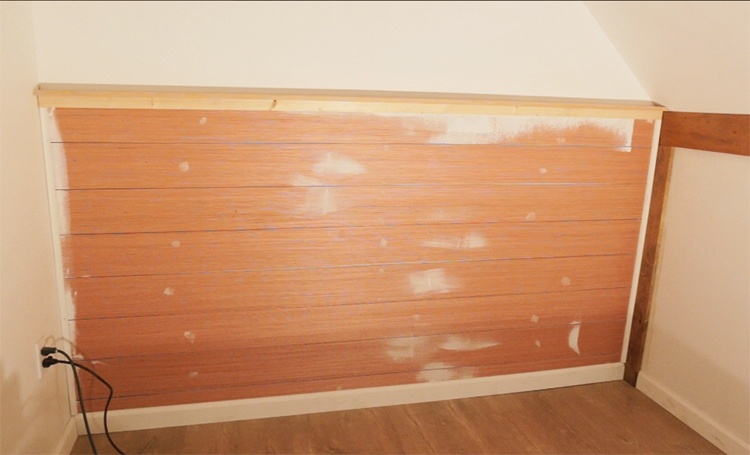 We had issues with that before with the wood bleeding through after a year or so. We now always use an oil based primer on anything that has knots. Just curious?!? Where or how can I watch episodes 1-9? Everything looks amazing! 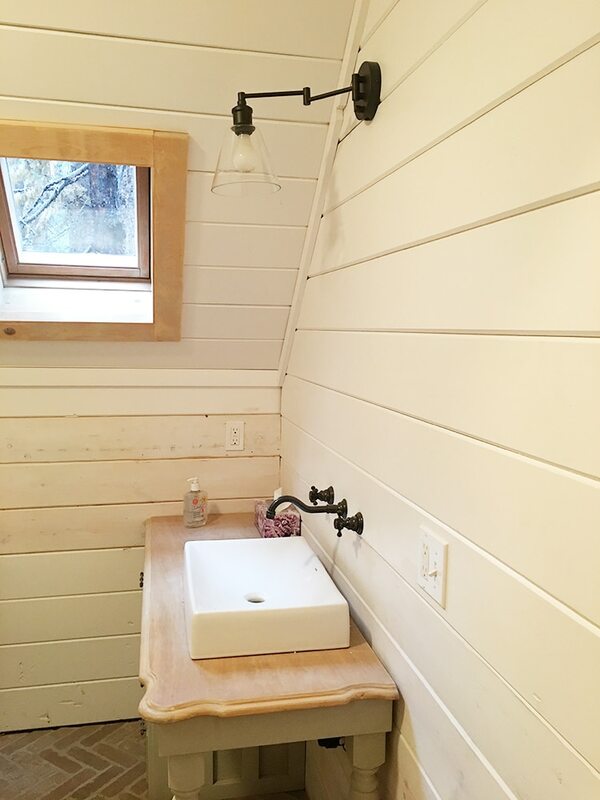 I’m in awe of the floating shelf brackets! I pinned that for an upcoming project! Quick question though…did you purchase one of their wooden shelves (from Silicate Studio) or did you use your own reclaimed wood? I love how it turned out! !